The spacious Master bedroom is located on the main floor with private bathroom. The Lodge House is a unique timber-framed paniolo-style ranch home made of high quality large yellow cedar wood. Come enjoy paradise in this relaxing, beautiful home with spectacular ocean and sunset views from just about every room. Relax on the expansive font deck overlooking the ocean / see the Whales spouting when they are migrating through Hawaii. Finish your day barbecuing on the grill and enjoy your food in our fully furnished kitchen. We fell in love with this magical property on top of the hill and decided to build a unique dream house for our retirement. We are too young to retire so decided to share it with you and your family as a vacation rental. North Kohala is known as God's country. It is the richest part of the island in terms of natural beauty. There are spectacular coastal views and You can see the chain of Hawaiian Island from the Lodge. There are moonbows on certain nights. Star gazing is perfect from this property. Bathrooms are on the main level. One is located in the Master suite and the other is location in the common living area located at the bottom of the stairs. 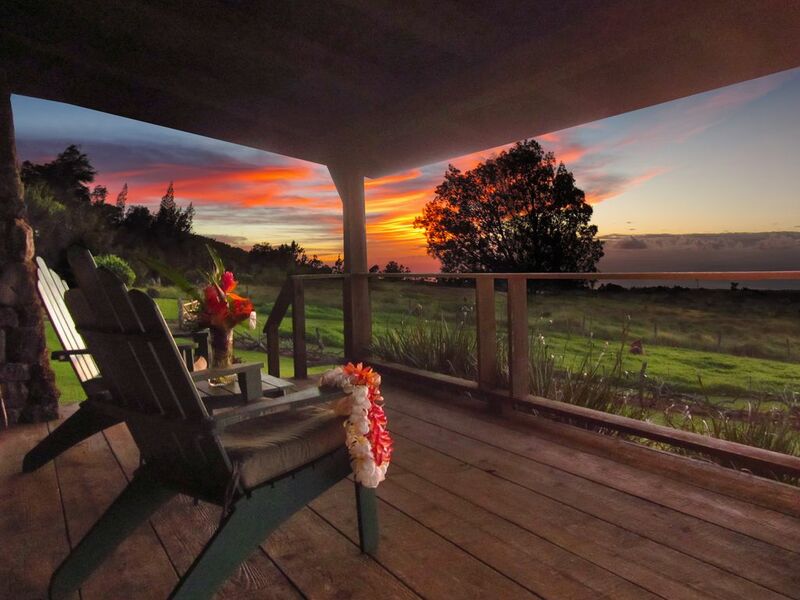 1400ft elevation - with 200 degree coastal view of the Hawaiian chain of Islands. Great Room Cathedral Ceilings 30 feet high with ocean views. Replica of Vintage Monarch Wood Stove. Made by Heartland. Gas Top 6 burner. Electric convection oven. Perfect for family cooking. Fully stocked to services large family meals. Dinner Cruises within 30 minutes. Front porch deck 40 feet by 10 feet - 400 square feet with beautiful ocean views. 30 minute drive to some of the best golfing in Hawaii. A wonderful ranch house, impeccably kept with incredible attention to detail. Beautiful panoramic views. Gracious hosts. It had everything we needed/could imagine. It was away from beaches and activities (30 min drive) but that simply prompted us to adventure every day. We totally enjoyed our stay at Paniolo Ranch house. The house itself has been carefully built in the style of a 1890's ranch house. Chris, the landlord, has many interesting stories about this process. The setting is spectacular with a view across green pastures down to the ocean. And the livestock is endlessly entertaining from newborn lambs to old rams. This house served us well as a refuge each evening after touring the island and as a destination in itself where we could sit and take in the beautiful setting. As an added bonus, Carol's store in town has lovely merchandise. Be aware that the second and third bedrooms are actually a shared loft. Screens are available for some privacy, but it is not for those who need isolation from the rest of their group. Thanks, Chris and Carol for a beautiful week. Beautiful view of ocean, calm atmosphere, and spacious luxury house. It's realy special. Recommend for those who wants stay calm and luxury. We've very much enjoyed warm breeze sitting at the front deck, Watching blue ocean during daytime and stars at night provide a very comfort and cozy experience. Cute goat and horses are wandering around green front yard but not buzy or noisy, just adding lylic atmosphere with a vivid colorful objects. We two just stayed 3 days, too short to enjoy everything in this house. We must have stayed at least a week. This beautifully built lodge was a wonderful place for 2 couples to stay. It is spacious, clean, and well-appointed, with the incredible view being the highlight. Loved watching the horses and sheep in the field with the water view and Maui in the distance. Great place to relax and also well located for exploring the area. Chris was welcoming and available for questions but respectful of our privacy. We enjoyed the quiet surroundings of the land and also enjoyed watching the animals. The lodge had the nice touches of home and we appreciated having a nice grill and also a well appointed kitchen. Chris and his family were extremely helpful and kind and we look forward to returning soon! Kohala Ranch looked like it came out of a fairy tale. Beautifully landscaped, super cute farm animals, and a really great log home. It was close to beaches and many other adventures. Hawi town is very quaint and the people are super friendly. Highly recommend staying here and definitely will be back.